I just can't help myself when it comes to 4x strategy games. My plan was to wait for one of those crazy Steam sales to purchase Sword of the Stars 2, instead I bought it when it was released. I deceided to make a First Look video, which shows my first 15 minutes with the game plus commentary. Sadly, the launch of the game had some problems. It is still playable (as the video shows) and they are working hard to fix the issues. 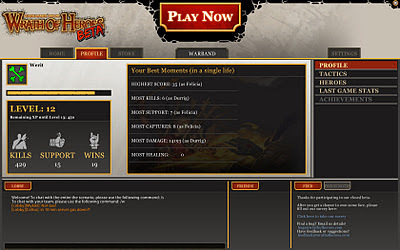 It's almost time for the next block of Wrath of Heroes beta testing. That means news about what is coming up for the weekend. Two new heroes have been added, and some are taking time off. The new beta schedule is out as well, read on for more details. As usual, check out the Wrath of Heroes Facebook page for the original. Conrad. That's right, a new Hero with some Healing abilities! Conrad is a Warrior Priest. Finally Glowgob can take some time off after carrying every team on his back. I'm guessing Conrad will do his healing through melee attacks, but we should know for sure tomorrow. Glowgob and Felicia will not be in this weeks lineup. Sounds like they want to make sure some other classes get tested well. See you there! In the mean time, you can watch some beta gameplay footage. Last month, Warhammer Online turned three years old. As a part of the celebration, all players who have been subscribed for three years received some special gifts. These are given out around the time you are first billed, so they have started to arrive in players Account Entitlements window. I checked mine and there they were waiting for me. I went with the Yellow Jack O' Lantern pet (out of 4 choices). The scarecrow has a nice laughing idle animation. I also used my Box of Endless Dye: Blazing Orange and Chaos Black to make some Dye's to get in the Halloween mood. The Demon Mood Rising Live Event is currently going on, so I could have added a nice mask too. During last weekends beta test, I recorded a match of Wrath of Heroes. I figured it would make a good introduction to the game, so I also gave it some commentary. I drone on about what Wrath of Heroes is and give a little play by play of what is going on. The match itself takes place in the Arena, which is a team deathmatch scenario. I am playing Felicia the Flamekissed most of the time since I had a good amount of experience with her and wanted to look decent for the video. Hope you enjoyed it. The NDA for WoH is down, so if you have any questions feel free to ask. Beta e-mails were sent out today letting Wrath of Heroes testers know that there will be more playtest sessions this weekend. Feels like it's been years, glad to see it back. There is some big news to go along with it! Well, big to me, especially if you look at the spiffy new banner at the top of the page. A new Hero joins the mix, Durrig the Engineer! You know who I'll be playing this weekend. Also of note, tactics will be in this build it seems. That means we can get a little customization going. Check out the Facebook page for all of the details. It's time for Round 5 of the upcoming Tier 7 Armor Sets for Warhammer Online. We still do not have official word on how to obtain them, but the new Fortress system is the most likely candidate. These are slated to be appearance armor rather than have stats on them. That means the power gap should remain the same. Let's get to the pictures! This set doesn't do anything for me. Then again, neither does the class. I guess Elf lovers will like it though, as it seems very Elfy. Now we're talking! I do like this one quite a bit. It's not very flashy and just plain mean looking. Orc's don't need frills. This set is pretty cool too. It's not as mean and lean as the Black orc's, but it pretty Dwarfy. I could definitely see my IB sporting this armor. Last week, BioWare released a new video segment called Choose Your Side. It is basically what many of us did as kids, argue about who would win in a fight. And by kids, I mean some of still do that now. This first video was about the Jedi Knight versus the Bounty Hunter. I enjoyed it quite a bit, so give it a watch if you have not already. After the video, we will get down to business and answer the question. So, who would actually win in a fight? Not in the game mind you, but real life. I think the answer is pretty obvious, even if I don't like it. The Jedi Knight would trounce a Bounty Hunter. First of all, they pretty much have super powers. Some can see the future, control peoples minds, throw X-Wings and the list goes on. Plus they have swords made of lasers. I am no Force lover but even I have to admit that they'd probably win in a fight. What has a Bounty Hunter ever done anyway? Bobba Fett was a chump who never actually did anything. His "father", Jango, didn't fare much better against Obi Wan. What do you call the person you were cloned from anyway? There is an exception, is the Bounty Hunter a droid? If so, then they may have a chance. It's been shown that Jedi have a problem defeating droids. In Phantom Menace for example, the Droid Destroyers gave them a tough time. In Empire Strikes Back, there was a droid Bounty Hunter named IG-88. He was also a boss in one of Star Wars Galaxies heroic instances. He might have a chance against a Force user. 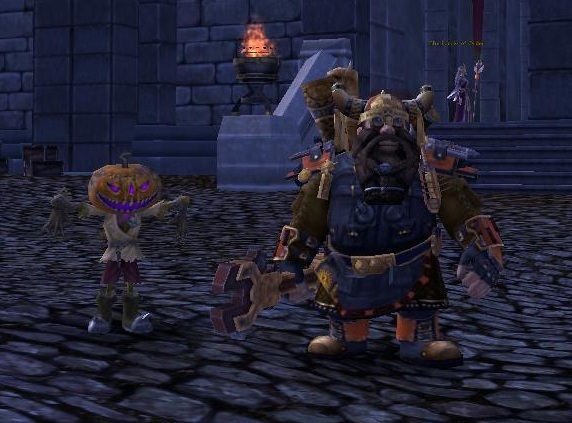 One of the common trends in MMO's is the simplification of the solo game. Of course, it is all being done in the name of accessibility. The challenge, and I use that word loosely, is put behind the velvet rope of group play. As someone who enjoys the solo game, this ends up making a lot of games just not fun for me. My definition of challenge is simply having to think. In many PvE games, very little thinking is required to get to the level cap. Sure there might be a lot going on which appears to add complexity, but usually it is completely superfluous. I want the decisions I make to actually matter. I'd also like to have to prepare for a battle. Crafting is a lot of fun, until you realize it is not necessary. It may shave 1 second off of the battle, but it isn't needed to actually defeat your enemy. It's nice to get a ton of abilities, but what is the point if you really only need two or three of them? Again it usually comes down to making the fight shorter. Story is usually what makes PvE bearable to me, but what happens when the actual gameplay is not challenging? You set out to defeat a great evil, and he dies in 5 seconds to a couple abilities. That doesn't really match up with the idea of a heroic story. There are a number of games which do try and give their solo players and challenge. Star Trek Online, for example, has difficulty sliders which affect all of their combat. Raising this actually made me feel like my choices mattered. Lord of the Rings has skirmishes which allow you to adjust their difficulty. Sadly, that does not apply to their epic quest-line. One common suggestion is to seek out higher level content. I find that it usually doesn't help, it is either still easy or impossible. Combat formulas in most MMO's end up preventing you from really doing anything to a monster who is X amount of levels higher than you. I've done group content in my time, including some raiding. I never actually found it challenging, instead it was just tedious. Dealing with other players is hit or miss, and most group content is just following a script anyway. Besides, I just don't have the time to do that anymore. Is it too much to ask for some challenging solo content? That's why I enjoy PvP games like Warhammer Online and League of Legends. I still think there is a place in my gaming life for PvE though, I just need it to be interesting. Since the release date for Star Wars: The Old Republic has been announced, I can't help but start to get a little excited about the game. We still have a long way to go until December 20th, but the end is now in sight. One of the sites involving SWTOR which I especially enjoy is The Jedi Gambit.